What if Facebook’s Messenger app could complete tasks and find information you need, on your behalf? 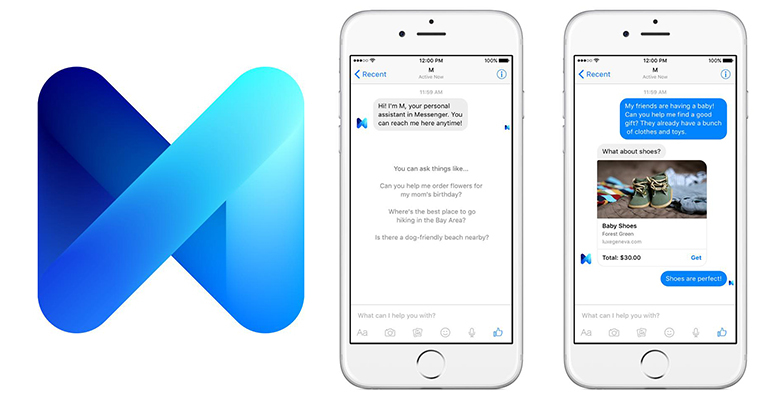 Enter, Facebook M: a personal digital assistant inside Messenger! Facebook M doesn’t work alone. M is trained and supervised by people to perform tasks like buy things, organise delivery, book travel, make restaurant reservations and more. M: Go on, ask me to organise something for you. M: Okay, let’s start with food. You like food. Are you hungry? Shall I make a restaurant booking? M: Maybe later. How about a weekend getaway? I’ll book it?! Or something like that. We do understand that Facebook prompted Messenger users to test the AI, like suggesting a restaurant or weekend getaway, and then offering to book it! Why might M have one over Siri? David Marcus, VP Messaging Products at Facebook (previously worked at PayPal as CEO, Zong and more), said that M can perform tasks that other AI virtual assistants can’t, simply because M is also powered by real people, not relying solely on technology. With Marcus on board, Facebook tripled its Messenger users to more than 700 million. M gives more power to the mobile device user. Tasks that were best suited to desktop use are now unlocked and open to hand-held devices with M technology. Users can tap a small button towards the bottom of the Messenger app, and send a message to M. M will read the message, ask any follow-up questions, and send the user updates as the task is being completed. M doesn’t come pre-informed with your partner’s birthday, your neighbour’s name or your favourite food, so you have to provide this information in the message thread with M. M will remember the messages you’ve sent between each other, and will be able to base future task requests on that information. help me organise a dinner party? where sells X beverage in X town? Eventually, M will reach everyone with Messenger and be free for users.